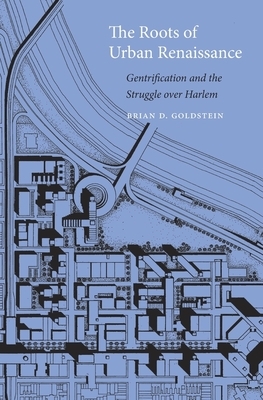 On Tuesday, October 17th at 7pm, join us to celebrate Brian Goldstein's The Roots of Urban Renaissance. Brian will be joined in conversation by Mario Gooden. Displaying gleaming new shopping centers and refurbished row houses, Harlem today bears little resemblance to the neighborhood of the midcentury urban crisis. Brian Goldstein traces Harlem's widely noted "Second Renaissance" to a surprising source: the radical 1960s social movements that resisted city officials and fought to give Harlemites control of their own destiny. In the post-World War II era, large-scale government-backed redevelopment drove the economic and physical transformation of urban neighborhoods. But in the 1960s, young Harlem activists inspired by the civil rights movement recognized urban renewal as one more example of a power structure that gave black Americans little voice in the decisions that most affected them. They demanded the right to plan their own redevelopment and founded new community-based organizations to achieve that goal. In the following decades, those organizations became the crucibles in which Harlemites debated what their streets should look like and who should inhabit them. Radical activists envisioned a Harlem built by and for its low-income, predominantly African-American population. In the succeeding decades, however, community-based organizations came to pursue a very different goal: a neighborhood with national retailers and increasingly affluent residents. In charting the history that transformed Harlem by the twenty-first century, The Roots of Urban Renaissance demonstrates that gentrification was not imposed on an unwitting community by unscrupulous developers or opportunistic outsiders. Rather, it grew from the neighborhood's grassroots, producing a legacy that benefited some longtime residents and threatened others. Brian D. Goldstein is Assistant Professor of Architecture at the University of New Mexico. Mario Gooden is the author of Dark Space: Architecture, Representation, Black Identity. He is a principal of Huff + Gooden Architects and a Professor of Practice at the Graduate School of Architecture, Planning and Preservation (GSAPP) of Columbia University where is also the co-Director of the Global Africa Lab (GAL). He is a 2012 National Endowment for the Arts Fellow and a MacDowell Colony Fellow.